The first round of the 2010 Character Cup is drawing near it's conclusion as we head straight into the penultimate matchup. 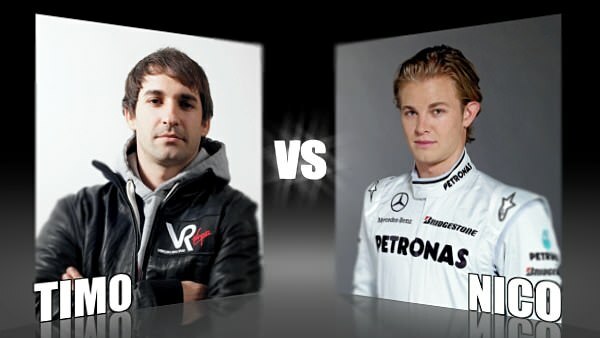 Today you have to decide who will get your vote between two German drivers - Virgin Racing's Timo Glock or Mercedes' Nico Rosberg. You have the power to decide who gets through to Round 2. We've learnt a lot more about Timo's character this year as he settles in for new team Virgin Racing. He's been spotted in the paddock supporting his home team during the World Cup - including waving flags and wearing wigs in the German colours. He's also been active on Twitter, inciting a cooking competition dubbed "Ready Steady Glock." Nico is teased by a lot of people both in and outside of the paddock, for his good looks and floppy blonde hair. He's been underrated through a lot of his career, and 2010 is the season when he can prove his worth - unexpectedly taking on the might of Michael Schumacher in the car across the garage. This must be adding to his character and life experience's but how does it make you feel about him?